The penultimate round in the 2010 Formula 1 tour, the Brazilian Grand Prix started with four drivers in contention for the season's world driver's championship. Suffering a massive meltdown during the Korean Grand Prix, the Red Bull Racing duo of Sebastian Vettel and Mark Webber left without scoring championship points. With Webber parked, Ferrari's Fernando Alonso cleaned up racing to victory on the wet Korean race circuit propelling himself into 1st place with an 11-point advantage. Contrary to the Korean Grand Prix, the weather for the Brazilian Grand Prix was an absolutely bright, sunny day. However, Saturday qualifying did present a watered-down Autódromo José Carlos Pace track. As the track transitioned, Williams F1's Nico Hulkenberg surprised many by claiming pole ahead of Red Bull Racing and McLaren. Hulkenberg's honour was quickly disregarded by the Formula 1 field as the Williams-Cosworth was simply no match for the Red Bull-Renaults off the standing start. With Sebastian Vettel using a superior start to out-drag his fellow German native into the first corner, Mark Webber got by the Williams on the track's third turn. 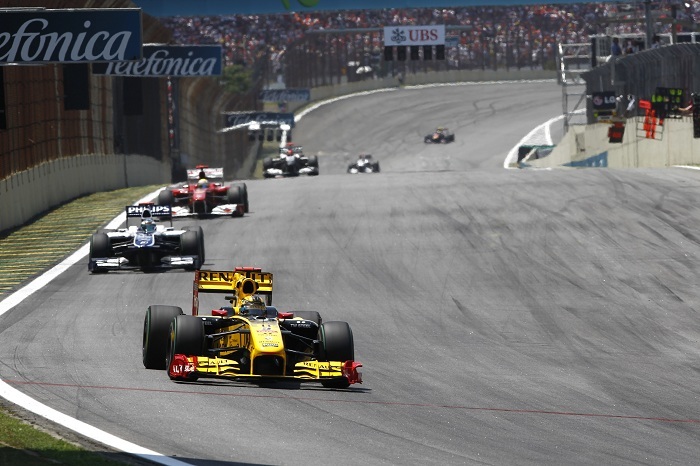 As Nico Hulkenberg continued a gradual drop down the running order to settle within the bottom end of the top-10 for the duration of the event, the Red Bull Racing cars installed themselves into Brazilian Grand Prix's top race positions. Formula 1 current driver's points championship Fernando Alonso weaved his way into third place but his Ferrari lost touch with the Red Bull-Renaults. By mid-way through the 71-lap grand prix, the gap between 2rd place and 3rd was over 16 seconds. Unable to fight for the front, the McLaren-Mercedes race cars of Lewis Hamilton and Jenson Button ran competitively but were unsuccessful in preserving the team's chances for the manufacturers championship. Unlike the Korean Grand Prix which resulted with a sizable casualty list, the Formula 1 race at Brazil ended with one official retirement. That solitary vehicle not finishing the Brazil Grand Prix was the Force India-Mercedes of Vitantonio Liuzzi that ended the race with a collision into the turn 2 pit road wall at lap 50. As the wreckage of the Force India-Mercedes littered within the narrow off-track area, safety car period was necessary to clean up the turn 2 portion of Autódromo José Carlos Pace circuit. Under the brief period behind the Mercedes SLS AMG safety car, some teams used this opportunity to take on fresh slick tires. McLaren and the Mercedes GP pitted while the top-3 maintained its composition. As the race was sent back to green on lap 56, the restart had a collection of slower race cars separating the 3 top Formula 1 cars aiding in Vettel's defense of the lead over Mark Webber. While Liuzzi's crash was the only race-ending collision, their was no shortage of contact on the Brazilian race circuit. Ferrari driver Felipe Massa ended his home country's grand prix in 15th place after no fewer than two incidents of contact with other race cars. The latest incident occurred between Massa and Renault's Vitaly Petrov in turn one as they were fighting for position late in the grand prix. Both drivers continued to finish the race. Other Brazilian drivers including Rubens Barrichello and Bruno Senna were also presented with disappointing results in their home grand prix wanting to impressive the country where their careers were first stoked. Despite some minor drama regarding fuel mileage concerns on the final laps, the Red Bull-Renaults rolled down the track's front stretch with Sebastian Vettel taking the victory in the Brazilian Grand Prix. Mark Webber's second place run guaranteed Red Bull Racing their first constructor title in Formula 1 with a 48 point cushion over McLaren heading into the final race at Abu Dhabi. Playing follow the leader throughout the event, Fernando Alonso settled with 3rd gaving up points to both of his main drivers title opponents. Moving from 11 points behind to a tighter 8 point gap behind Alonso, Webber closes along with teammate Vettel now 15 points away from lead. Finishing 4th in the Brazilian Grand Prix, Lewis Hamilton barely holds onto F1 World Championship contention but would need an awful amount of trouble to plague the forward three in the points at Abu Dhabi in order to gain the McLaren driver's 2nd F1 title. Other qualifying on pole, Nico Hulkenberg's race resulted with a respectable 8th place run improving two spots thanks to the pitting during the safety car period.